12x 20 wooden sign. See pics for condition -. SUPER COOL PIECE TO HANG AROUND. 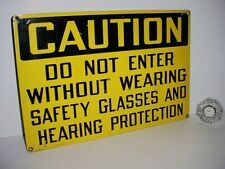 SAFETY GLASSES AND HEARING PROTECTION. THIS PIECE IS 18" LONG AND 12" HIGH. I HAVE A CAUTION SIGN IN MY OFFICE, IT'S A COOL LOOK. IT IS IN EXCELLENT CONDITION FOR BEING IN USE FOR YEARS. The San Diego Heaven on Earth Club. Joseph E. Dryer - President. 1938 - San Diego, California. I have several sizes available. 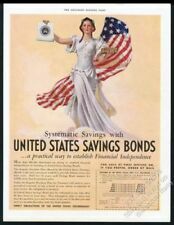 No, these certificates are sold as collectibles only; although they are authentic, they no longer hold financial value. WE HAVE THE BEST PRICES ANYWHERE! DON'T SETTLE FOR MADE IN CHINA JUNK!! BETSY & BILL & THE NICE BAD MAN. Appears to be from the 1960s. Great for a college dorm room, etc. 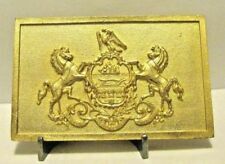 If there is a display piece visible in any picture, it is NOT included unless otherwise stated. Olympic Sponsor Pin. & Eagle Network Hub Pin. Sign Reads - "U.S. Marshall Office, Deadwood, Dakota Territory, March 27, 1861". Has Four Holes On Each Corner Of The Plaque For Wall Mounting. It says “Play Now…Retire Later”. I only left it on since it protects it from being scratched. SMOKEY BEAR CHECKING MAIL! LICENSED U.S. FOREST SERVICE METAL SIGN MADE IN USA! DON'T SETTLE FOR MADE IN CHINA JUNK!! It has light wear and tear from storage. There are no tack, staple or nail holes. It is not dated. Old Forest Service Sign. 5 1/4" x 10".013" thick as compared to regular blue-line. which is approx. It says “Play Now…Retire Later”. The top of the cufflink is 3/4"long,maximum width is 5/8". new never been used. I believe it is a survey sign. (Check the pic for more accuracy of the sign). DON'T SETTLE FOR MADE IN CHINA JUNK!! SIGN HAS WORKING MOVABLE GAUGE! THIS SIGN HAS AN INTERESTING DISTRESSED ANTIQUE APPEARANCE TO IT WITH A BEAUTIFUL MOUNTAIN SCENE BACK ROUND. Great for a college dorm room, etc. EVERYTHING is sold "AS IS" unless specified. EVERYTHING IS USED UNLESS OTHERWISE SPECIFIED! If there is a display piece visible in any picture, it is NOT included unless otherwise stated. Vintage Smokey Bear elusive bendy 1967 U.S. Forest and Ag Dept. Made in cooperation with state foresters and the advertising council in 1967 and authorized by the U.S. Dept of agriculture. Truly a collectible Smoky. I am Not a Belt Buckle expert. It is complete, with plenty of wear along the edges. Scotch tape or residue in the corners. But above all else.HAVE FUN! 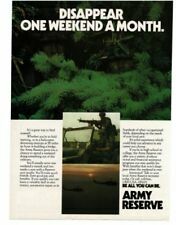 The Service School Command in Orlando, FL was established in 1969 to provide training. Applications for social security accounts are available through employers. Hand it back to your employer. Hand it to your letter carrier. - Do it now. Year: 1935. Each of our prints are custom reproductions printed on 68lb Heavyweight Enhanced Matte Art Paper. 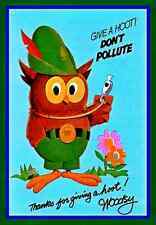 Give a Hoot Don't Pollute music. The Ballad of Woodsy Owl. Woodsy Owl has 104 ways to stop it. DUE TO THE AGE OF THESE COASTERS, THE IMAGE IS NOT 100% CRISP LIKE THE NEW PRODUCTS THAT WE MANUFACTURE. 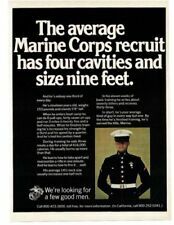 THEY ARE PROBABLY 1/8" THICK. THERE IS 4 TO A SET. Vtg US Civil Defense Fallout Shelter Galvanized Sign 1960s Man Cave 14"x 20"
CONDITION: in good condition for age! Condition may vary from pictures as we have several of these signs but will be similar. Expect wear consistent with age, especially around the edges from being dinged in storage. Vintage Usps Posta Service Clip On Pins. 1997 I'm here to help usps star shaped pin 3"..1997 I'm here to help usps blue with candle pin 2-7/8" long...1996 I'm here to help pin with bell 3-2/8" pin... 1996 I'm here to help snowman pin 3"... 1995 usps may I help you pin 2.75" long... we've got the time for you... pin with clock 3" tall.. and shop ship relax ornament 3.25".. see pics for greater details Condition is Used. Shipped with USPS First Class Package. 2 Smokey Bear patches On the left, "Inland Northwest Council 2010 Centennial Camporee Only You Can Prevent Wildfires" 3 1/8" x 2 1/8" On the right, "Junior Forest Ranger Prevent Forest Fires 2 1/2" x 2" This patch has been used, as explained above under 'condition'. 3 5/8" x 3" Have been displayed and protected in a binder since new. Terrific addition to your Smokey Bear collection! The pins look like the Benefitting Mankind stamp set. These 4 all say "Benefitting Mankind" on them. The other four are Exploring the Moon, Probing the Planets, Understanding the Sun, and Comprehending the Universe. 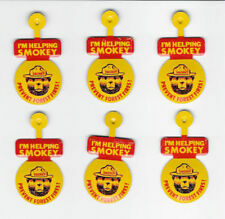 WE ACQUIRED ALL SORTS OF INTERESTING SMOKEY BEAR COLLECTIBLES OVER THE YEARS! Aviation Week & Space Technology April 16, 1973. 2 - XFV-12A fighter/attack aircraft full page color illustrated cards with specs on the backside. Illustrated model 301 tilt rotor aircraft booklet. Navy hoover craft booklet.